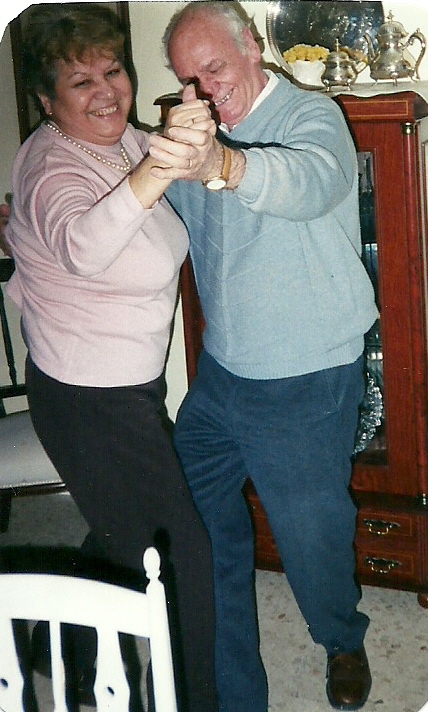 I studied in Spain for a semester when I was a youngling, and while there I lived with a wonderful Spanish couple named Trini and Pepe. Trini would often come into the room I shared with my American roommate and ask us, “Que quereis comer? ?” There was only one thing Trini made that we didn’t want to eat–cold hard boiled eggs stuffed with tuna and dropped in marinara sauce–but otherwise we loved all her food, so this was always a hard question. 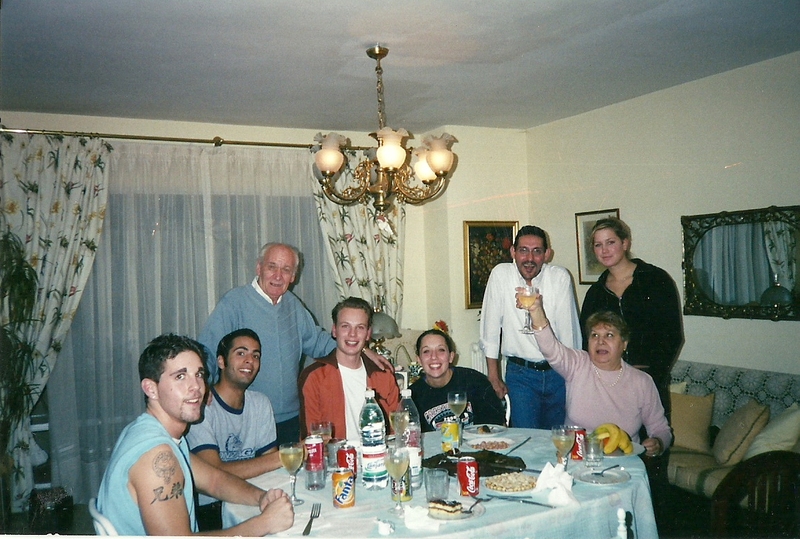 Trini, Pepe, their son, and all of my many Dutch and American hostsiblings, gathered around the table after another spectacular Spanish meal. Trini made flawless paella with squid and gambas the size of your hand, on Tuesday afternoons, as if it was no big deal. She would serve huge platters of golden, whole fried anchovies with lemon as an appetizer. Pepe owned a bakery and would make us homemade flan, serving only the perfect ones that slid onto the plate without cracking, and cakes made with chocolate and butter and nuts and three kinds of alcohol. Trini and Pepe’s talents were not limited to the kitchen. In other words, it was a food paradise, but one of the most-requested dishes in the house was also one of the humblest: lentejas con chorizo. A bowl of lentil soup with a chunk of Pepe’s crusty white bread just always seemed to hit the spot. So, when I found out that lentils (as long as they are properly soaked overnight) are SCD-legal, I immediately thought about Trini’s lentejas. 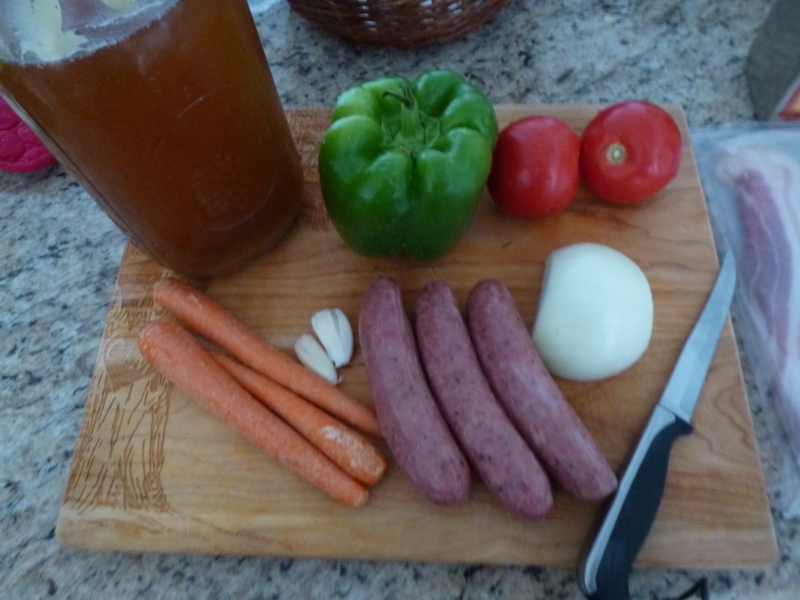 This version is not super authentic, since I can never seem to find real Spanish chorizo and since I substitute carrots for potatoes and American bacon for a Spanish cured ham, but it’s satisfying, nutritious, easy to make, and reminiscent of Andalucia all the same. This is all you will need, plus some spices (and the lentils of course!). 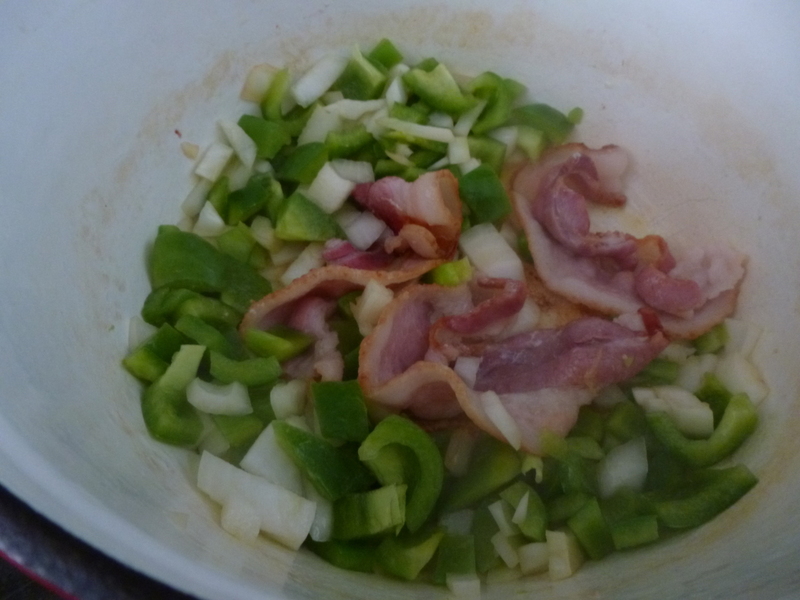 Saute your bacon with peppers and onions. Remove bacon when it’s done and set aside. 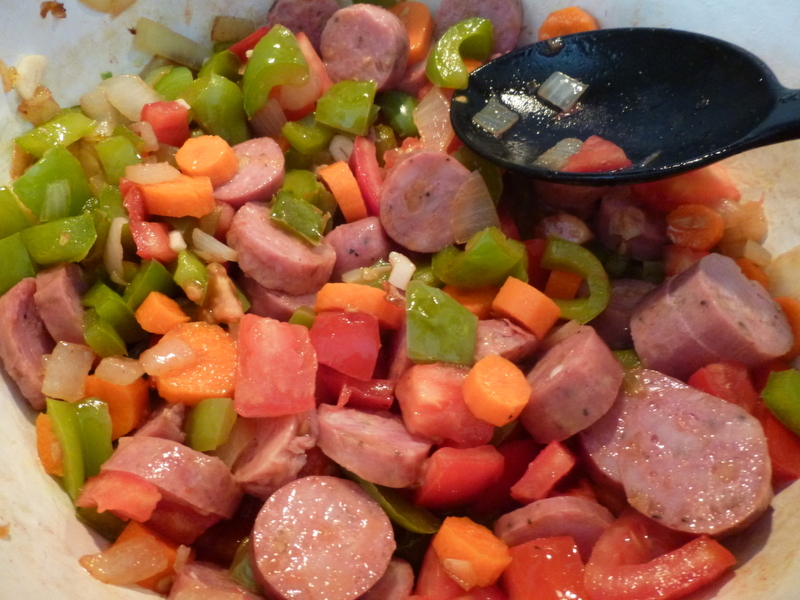 Add in other veggies and sausage and cook until all the veggies are soft. Now add in the chicken stock and lentils, bring to a boil and reduce down to a simmer. Cook until lentils are soft. Taste and adjust seasoning, and serve! The night before you want to make this, place lentils in a stockpot with enough water to generously cover them. Bring the water to a boil, then turn the heat off, cover, and leave to soak overnight. When you are ready to cook them, strain them, discard the soaking water, and rinse with fresh water. Cook bacon in large stockpot until starting to brown. Add in olive oil, bell peppers, and onions and cook over medium heat until soft. Remove bacon and set aside. 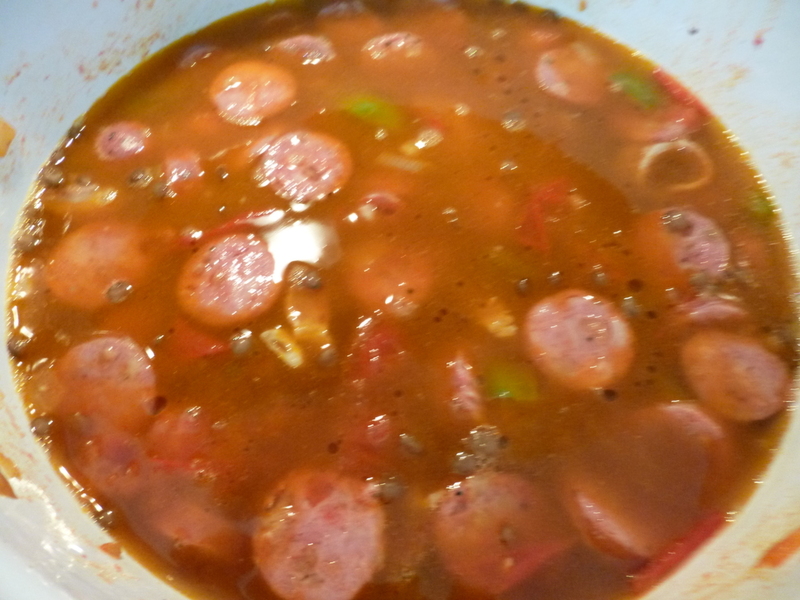 Add in tomatoes, carrots, garlic, and sausage, and cook about 5 more minutes, until vegetables are mostly soft and tomatoes have started breaking down. Chop up bacon and add back into the pot. Add in the soaked, drained, and rinsed lentils and enough chicken stock to cover them by 1-2 inches. Bring to a boil. 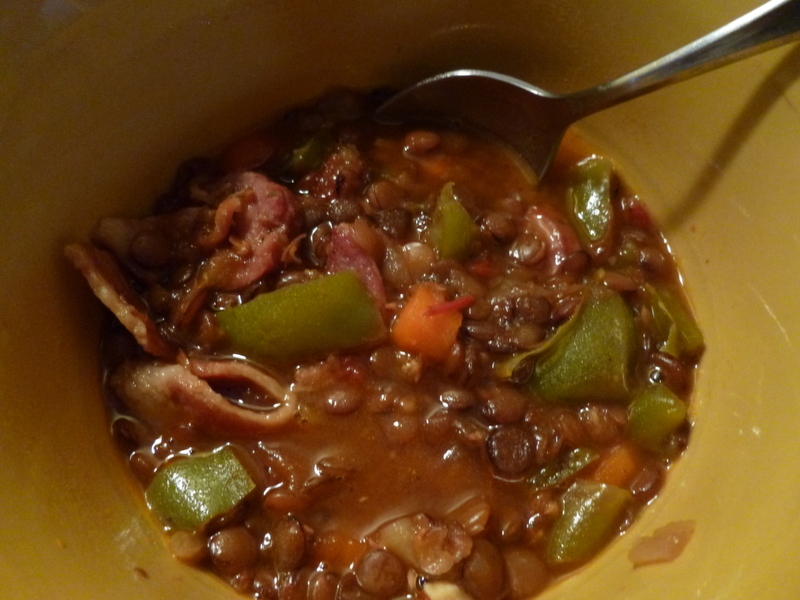 Then reduce heat and let simmer about 45 minutes, until lentils are very soft and much of the liquid has reduced. Taste and adjust seasoning.